St. Cyril will always remain one of the most disturbing sights that I have seen. More then any shuttered hotel, theater, or train station an abandoned church in the middle of a decimated neighborhood testified to the destruction of a community. That something so big and beautiful was created by proud but poor working class is a testament to their faith. Yet all this effort was to be abandoned only 80 years later. 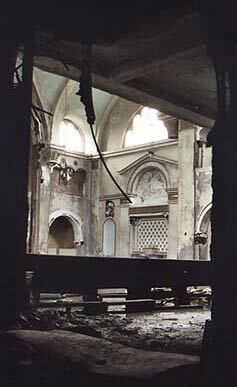 I have since seen several other abandoned churches, some even more impressive then St. Cyril, but none have had the same impact. No other has represented the end of a neighborhood as directly as St. Cyril. Now that St. Cyril is gone gradually the remaining houses will join it to oblivion. If all goes according to plan an industrial park will rise over the site. There will be no trace left of the area's former residential character. Meanwhile the former Packard plant will continue to decay a few blocks away.